In today’s digital world, everyone is looking ways to make money online. There are a lot of ways to make money online but blogging is the best and genuine way in all of them. I know, starting a blog might be a little terrifying thought for you in the beginning, especially when you don’t know where and how to start. You are in the right hand. In today’s article, I will guide you on how to start a blog even if you are a beginner or don’t know the technical things. How Much It Will Cost Me to Start a Blog? If you’re curious about how much it will cost to start and maintain your blog, the simple answer is $0 to $80 or more per year. There are two ways, one is free and the second one is paid. I highly recommend that you go for paid one, but you have the option to start for free to test the blogging. The meaning of niche is simply the topic of your blog. This is where 90% bloggers failed in their blogging career. Choosing the blog niche should be the first step before starting anything. Because, without a clear subject and goal in mind, your blogging is waste of time. Your blog topic or niche will determine everything to your blog. If you want others to read your blog, you should talk about the specific topic on your blog to grow your blog quickly and build a targeted audience. When you talk about everything, it becomes really difficult to promote your blog and build your audience. By defining the blog niche, you’re not limiting the growth of your blog. You can expand your niche in future when you gain some popularity and authority in your niche. Always choose that blog topic (niche) in which you are interested and have good command. Because blogging is just kind of fun. If you are not enjoying what you are doing, then your blogging is waste of time. Always remember, except for your interest, your blog niche should have future also. If you have no idea how to find a suitable niche for your blog, go through this simple process. Your Interest – First of all find the things you are interested in or interested to learn. It could be cooking, traveling, personal finance, fitness, sports, etc. Audience Interest – Except your interest also look for audience interest. If the majority of people are not interested in which you are interested, you can never make your audience or drive traffic to your blog. Marketing Demand – Next step is to look for the current marketing demand of the topic. Are people crazy enough in that niche? Future of The Topic – Before finalizing the niche you should also look for the future of the topic (niche). Will it work in long-term or not? After finalizing the niche, your next step should be choosing your blog name. Don’t waste too much time in deciding a perfect or cool name for your blog. Just choose a blog name which suits your blog niche and easy to remember. If you’re not able to find a good one, let me help you. Let’s move on the next step. There are many blogging platforms like Joomla, Wix, and Blogger to start a blog. But I will highly recommend you to go with WordPress. According to W3Techs, WordPress powers 32.0% of all the websites on the Internet. WordPress is an open source software, anyone can use it 100% free. All you need is a domain name and web hosting. This is why it also called self-hosted WordPress. The freedom of high-level customization makes it more popular content management system (CMS) among all the bloggers and marketers. It provides you more flexibility and amazing features compare to any other platforms in the market. 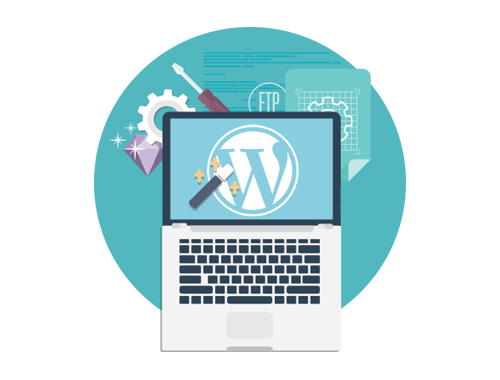 With WordPress, adding more functionality to your blog is quite easy. You just need to install ‘plugins’ from the official WordPress repository. A person who never heard about these terms might ask “What is web hosting and domain name?”. Don’t worry about these technical things, I’ll guide you through each an every step and make it super easy for you. Web Hosting: It is where your blog goes live on the internet. Web Hosting is the physical location of any blog or website, an online storage center that houses all the content of your blog. Domain Name: It is a unique name that identifies a website. For example, the domain name of Google is “google.com”. Each blog has a domain name that serves as an address, which is used to access the blog. Now, let’s find the good web hosting provider to host and live your blog. If I talk about web hosting, there are thousands of web hosting providers available on the internet. But choosing a good hosting provider really matters. In that case, I prefer SiteGround (web hosting provider). Because it provides top notch quality from speed to everything which your blog need at the earlier stage. As I know you are a beginner who just starting out. You may need some help & support. So good news is, SiteGround support is really awesome. They keep ready 24/7 for live chat support. Choose the plan according to your need. But I’ll suggest you go with “Grow Big” plan. Click to Get Plan button. To register your domain name with SiteGround, select “Register a New Domain” checkbox and type in your preferred domain name in the box. If you have already registered your domain name with another domain registrar like GoDaddy, you can select “I already have a Domain” and type in your domain name. Click to Proceed button to move further. Fill all the required detail to complete your account. This is need to complete your purchase. Now you are done with web hosting and the domain part. Wait for few minutes while SiteGround is setting up the account for you. Now, go to your email to check all the important information related to your hosting account. Now log into your SiteGround account. Note: All the important information related to your account is in your inbox. To install WordPress, select Start a new website checkbox and then click on WordPress icon. Now enter the admin details for your blog. It’ll be used to log into your blog. Note: Save this detail anywhere on the notebook or into your notepad to remember in the future. Now agree to the terms & condition and click on Complete Setup button to complete the WordPress installation process. Let SiteGround setting up the WordPress. Now click to Proceed to Customers Area button. You have successfully installed the WordPress and your blog is live now. Type: http://your-site.com into your browser. Note: Replace your-site.com with your domain name. Type: http://your-site.com/wp-admin into your browser. Now, enter the login details you choose during the installation and click the Log In button. After successfully logging, you’ll see your WordPress dashboard where you can manage your blog. You have successfully setup the WordPress. Now it’s time to change the look and feel of your blog. Yes, I am talking about your blog design. There are thousands of free and paid theme available in the market to use from. But every theme doesn’t come with great features. If you really want to invest in your blog and take it to the next level, go for paid option. As I use GeneratePress theme on my blog. It comes with a lot of customization and specially built for speed. It gives you the ability to customize your blog layout according to your need. How to Change Your Blog Theme? Here you can find a lot of free themes available on the WordPress repository. Just Install your preferred theme and click to Activate. First, purchase your preferred theme and download it to your computer. Now click on Upload Theme and choose the theme file from your computer. Click Install Now button then Activate it. If you’ll follow this 5-step process carefully, you can start a blog easily just under 30 minute. Now you have started your blog, it’s time to create your first article and boom the internet. If you have doubts or stuck somewhere, let me know in the comment section. Meantime stay with Make Blogging for more useful blogging tips and strategies to grow your blog further.